American test pilot astronaut 1987-1999. Flew in space six times. Status: Inactive; Active 1987-1999. Born: 1956-03-11. Spaceflights: 6 . Total time in space: 57.63 days. Birth Place: Elizabethtown, North Carolina. PERSONAL DATA: Born April 16, 1956 in Arlington, Virginia. Single. Died on February 1, 2003 over the southern United States when Space Shuttle Columbia and the crew perished during entry, 16 minutes prior to scheduled landing. He is survived by his parents, Paul and Dorothy Brown. David enjoyed flying and bicycle touring. He was a four year collegiate varsity gymnast. While in college he performed in the Circus Kingdom as an acrobat, 7 foot unicyclist and stilt walker. EDUCATION: Graduated from Yorktown High School, Arlington, Virginia, in 1974; received bachelor of science degree in biology from the College of William and Mary in 1978 and a doctorate in medicine from Eastern Virginia Medical School in 1982. ORGANIZATIONS: Past President, International Association of Military Flight Surgeon Pilots. Associate Fellow, Aerospace Medical Association. Society of U.S. Naval Flight Surgeons. AWARDS: Posthumously awarded the Congressional Space Medal of Honor, the NASA Space Flight Medal, the NASA Distinguished Service Medal, and the Defense Distinguished Service Medal (DDSM). SPECIAL HONORS: Navy Operational Flight Surgeon of the Year in 1986, Meritorious Service Medal, Navy Achievement Medal. EXPERIENCE: Brown joined the Navy after his internship at the Medical University of South Carolina. Upon completion of flight surgeon training in 1984, he reported to the Navy Branch Hospital in Adak, Alaska, as Director of Medical Services. He was then assigned to Carrier Airwing Fifteen which deployed aboard the USS Carl Vinson in the western Pacific. In 1988, he was the only flight surgeon in a ten year period to be chosen for pilot training. He was ultimately designated a naval aviator in 1990 in Beeville, Texas, ranking number one in his class. Brown was then sent for training and carrier qualification in the A-6E Intruder. In 1991 he reported to the Naval Strike Warfare Center in Fallon, Nevada, where he served as a Strike Leader Attack Training Syllabus Instructor and a Contingency Cell Planning Officer. Additionally, he was qualified in the F-18 Hornet and deployed from Japan in 1992 aboard the USS Independence flying the A-6E with VA-115. In 1995, he reported to the U.S. Naval Test Pilot School as their flight surgeon where he also flew the T-38 Talon. Brown logged over 2,700 flight hours with 1,700 in high performance military aircraft. He was qualified as first pilot in NASA T-38 aircraft. NASA EXPERIENCE: Selected by NASA in April 1996, Brown reported to the Johnson Space Center in August 1996. He completed two years of training and evaluation, and was qualified for flight assignment as a mission specialist. He was initially assigned to support payload development for the International Space Station, followed by the astronaut support team responsible for orbiter cockpit setup, crew strap-in, and landing recovery. Dave Brown flew aboard STS-107, logging 15 days, 22 hours, and 20 minutes in space. SPACE FLIGHT EXPERIENCE: STS-107 Columbia (January 16 to February 1, 2003). The 16-day flight was a dedicated science and research mission. Working 24 hours a day, in two alternating shifts, the crew successfully conducted approximately 80 experiments. The STS-107 mission ended abruptly on February 1, 2003 when Space Shuttle Columbia and the crew perished during entry, 16 minutes before scheduled landing. Born March 11, 1956, in Elizabethtown, North Carolina. Unmarried. One son. He enjoys water and snow skiing, scuba diving, air racing, restoring old cars, sailing, aerobatic flying. His mother, Mrs. Rachel H. Brown, resides in Elizabethtown, North Carolina. His father, Mr. Curtis L. Brown, Sr., is deceased. Graduated from East Bladen High School, Elizabethtown, North Carolina, in 1974; received a bachelor of science degree in electrical engineering from the Air Force Academy in 1978. Member, United States Air Force Association, and United States Air Force Academy Association of Graduates. Defense Superior Service Medal, Defense Meritorious Service Medal (2), Air Force Meritorious Service Medal, Air Force Commendation Medal, Air Force Achievement Medal, NASA Space Flight Medal (4). Brown was commissioned a second lieutenant at the United States Air Force Academy, Colorado Springs, in 1978, and completed undergraduate pilot training at Laughlin Air Force Base, Del Rio, Texas. He graduated in July 1979 and was assigned to fly A-10 aircraft at Myrtle Beach Air Force Base, South Carolina, arriving there in January 1980 after completing A-10 training at Davis-Monthan Air Force Base, Arizona. In March 1982, he was reassigned to Davis-Monthan Air Force Base as an instructor pilot in the A-10. In January 1983, he attended USAF Fighter Weapons School at Nellis Air Force Base and returned to Davis-Monthan Air Force Base as an instructor in A-10 weapons and tactics. In June 1985, he attended USAF Test Pilot School at Edwards Air Force Base, California. Upon graduation in June 1986, Brown was assigned to Eglin Air Force Base, Florida, where he served as a test pilot in the A-10 and F-16 aircraft until his selection for the astronaut program. He has logged over 6,000 hours flight time in jet aircraft. Selected as an astronaut candidate by NASA in June 1987, Brown completed a one-year training and evaluation program in August 1988, and is qualified for flight assignment as a pilot. His technical assignments have included: involvement in the upgrade of the Shuttle Mission Simulator (SMS); development of the Flight Data File (FDF); he served as lead of the astronaut launch support team responsible for crew ingress/strap-in prior to launch and crew egress after landing; monitored the refurbishment of OV-102 and OV-103 during ground turnaround processing; lead spacecraft communicator (CAPCOM); Astronaut Office Lead of Shuttle Operations. A veteran of four space flights, Brown has logged over 977 hours in space. He was the pilot on STS-47 in 1992, STS-66 in 1994 and STS-77 in 1996, and was spacecraft commander on STS-85 in 1997. 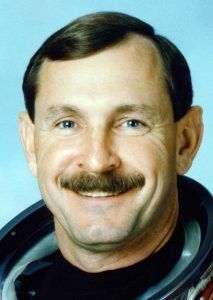 Brown is assigned to command the crew of STS-95. This mission will support a variety of research payloads including deployment of the Spartan solar-observing spacecraft, the Hubble Space Telescope Orbital Systems Test Platform, and investigations on space flight and the aging process. STS-95 is scheduled for launch in October 1998. STS-47 Spacelab-J (September 12-20, 1992) was an eight-day cooperative mission between the United States and Japan focused on life science and materials processing experiments in space. After completing 126 orbits of the Earth, the mission ended with Space Shuttle Endeavour landing at Kennedy Space Center, Florida. Mission duration was 190 hours, 30 minutes, 23 seconds. STS-66 (November 3-14, 1994) was the Atmospheric Laboratory for Applications and Science-3 (ATLAS-3) mission. ATLAS-3 was part of an ongoing program to determine the Earth's energy balance and atmospheric change over an 11-year solar cycle. Following 175 orbits of the Earth, the 11-day mission ended with the Shuttle Atlantis landing at Edwards Air Force Base, California. Mission duration was 262 hours and 34 minutes. STS-77 (May 19-29, 1996) was a ten-day mission aboard Space Shuttle Endeavour. The crew performed a record number of rendezvous sequences (one with a SPARTAN satellite and three with a deployed Satellite Test Unit) and approximately 21 hours of formation flying in close proximity of the satellites. During the flight the crew also conducted 12 materials processing, fluid physics and biotechnology experiments in a Spacehab Module. STS-77 deployed and retrieved a SPARTAN satellite, which carried the Inflatable Antenna Experiment designed to test the concept of large, inflatable space structures. A small Satellite Test Unit was also deployed to test the concept of self-stabilization by using aerodynamic forces and magnetic damping. The mission was concluded in 160 Earth orbits, traveling 4.1 million miles in 240 hours and 39 minutes. STS-85 (August 7-19, 1997) was a 12-day mission during which the crew deployed and retrieved the CRISTA-SPAS payload, operated the Japanese Manipulator Flight Demonstration (MFD) robotic arm, studied changes in the Earth's atmosphere and tested technology destined for use on the future International Space Station. The mission was accomplished in 189 Earth orbits, traveling 4.7 million miles in 284 hours and 27 minutes. Family: Astronaut. Country: USA. Flights: STS-47, STS-66, STS-77, STS-85, STS-95, STS-103. Projects: STS. Agency: USAF. Bibliography: 12, 5210. 1956 March 11 - . Birth of Curtis Lee Jr 'Curt' Brown - . Nation: USA. Related Persons: Brown. American test pilot astronaut 1987-1999. Flew in space six times. 6 spaceflights, 57.6 days in space. Flew to orbit on STS-47 (1992), STS-66, STS-77, STS-85, STS-95, STS-103..
STS-47 - . Call Sign: Endeavour. Crew: Apt, Brown, Davis, Gibson, Jemison, Lee, Mohri. Payload: Endeavour F02 / Spacelab-J. Mass: 12,772 kg (28,157 lb). Nation: USA. Related Persons: Apt, Brown, Davis, Gibson, Jemison, Lee, Mohri. Agency: NASA Houston. Program: STS. Class: Manned. Type: Manned spaceplane. Flight: STS-47. Spacecraft Bus: Shuttle. Spacecraft: Endeavour. Duration: 7.94 days. Decay Date: 1992-09-20 . USAF Sat Cat: 22120 . COSPAR: 1992-061A. Apogee: 310 km (190 mi). Perigee: 297 km (184 mi). Inclination: 57.00 deg. Period: 90.60 min. Manned seven crew. Carried Spacelab-J with microgravity and biology experiments. Payloads: Spacelab-J, nine getaway special canister experiments, Israel Space Agency Investigation About Hornets (ISAIAH), Shuttle Amateur Radio Experiment (SAREX) II, Solid Surface Combus-tion Experiment (SSCE). 1992 September 20 - . Landing of STS-47 - . Return Crew: Apt, Brown, Davis, Gibson, Jemison, Lee, Mohri. Nation: USA. Related Persons: Apt, Brown, Davis, Gibson, Jemison, Lee, Mohri. Program: Spacelab. Flight: STS-47. STS-47 landed at 12:55 GMT. .
1997 August 19 - . Landing of STS-85 - . Return Crew: Brown, Curbeam, Davis, Robinson, Rominger, Tryggvason. Nation: USA. Related Persons: Brown, Curbeam, Davis, Robinson, Rominger, Tryggvason. Flight: STS-85. STS-85 landed at 11:08 GMT. .
1998 October 29 - . STS-95 Mission Status Report # 01 - . Nation: USA. Related Persons: Brown, Duque, Glenn, Lindsey, Mukai, Parazynski, Robinson. Program: STS. Flight: STS-95. 1998 October 30 - . 1998 October 31 - . 1998 November 1 - . STS-95 Mission Status Report # 07 - . Nation: USA. Related Persons: Brown, Glenn, Lindsey, Robinson. Program: STS. Flight: STS-95. STS-95 Mission Status Report # 08 - . Nation: USA. Related Persons: Brown, Glenn, Mukai, Robinson. Program: STS. Flight: STS-95. 1998 November 2 - . STS-95 Mission Status Report # 09 - . Nation: USA. Related Persons: Brown, Duque, Glenn, Husband, Lindsey, Mukai, Parazynski, Robinson. Program: STS. Flight: STS-95. 1998 November 3 - . STS-95 Mission Status Report # 12 - . Nation: USA. Related Persons: Brown, Duque, Glenn, Lindsey, Mukai, Parazynski, Robinson. Program: STS. Flight: STS-95. STS-95 Mission Status Report # 11 - . Nation: USA. Related Persons: Brown, Duque, Glenn, Lindsey, Mukai, Parazynski, Robinson. Program: STS. Flight: STS-95. 1998 November 4 - . STS-95 Mission Status Report # 14 - . Nation: USA. Related Persons: Brown, Duque, Glenn, Lindsey, Mukai, Parazynski, Robinson. Program: STS. Flight: STS-95. STS-95 Mission Status Report # 13 - . Nation: USA. Related Persons: Brown, Duque, Glenn, Lindsey, Mukai, Parazynski, Robinson. Program: STS. Flight: STS-95. 1998 November 5 - . 1998 November 6 - . STS-95 Mission Status Report # 17 - . Nation: USA. Related Persons: Brown, Glenn, Lindsey. Program: STS. Flight: STS-95. 1998 November 7 - . STS-95 Mission Status Report # 20 - . Nation: USA. Related Persons: Brown, Duque, Glenn, Lindsey, Mukai, Parazynski, Robinson. Program: STS. Flight: STS-95. Landing of STS-95 - . Return Crew: Brown, Duque, Glenn, Lindsey, Mukai, Parazynski, Robinson. Nation: USA. Related Persons: Brown, Duque, Glenn, Lindsey, Mukai, Parazynski, Robinson. Program: STS. Flight: STS-95. STS-95 landed at 17:03 GMT. .
1999 December 26 - .